Obituary for Alice Marie DePeal | Langeland Family Funeral Homes, Inc.
Alice Marie DePeal died peacefully on Friday morning, March 9, 2018 in Grand Rapids, MI at the age of 103. Marie was born May 3, 1914 in Durand, Michigan the youngest child of William and Aletta (Chapin) Bruff. She had been a Kalamazoo area resident since 1981 and was a member of Lighthouse Community Church. On December 1, 1939, Marie married Rev. 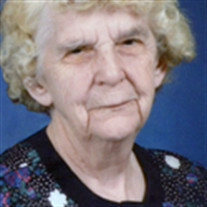 Melbourne E. DePeal who preceded her in death in July of 2009. Marie was also preceded in death by her parents; a son, Thomas Meredith; 4 sisters, Gladys Bruff, Irene Knoop, Leola Hunt and Gertrude May; and 2 brothers, Lynn Bruff and Leon Bruff. She is survived by 3 children, Nancy (Donald) Logan of Vicksburg, Daniel (Judy) DePeal of Walbridge, OH, and Lynn (Nancy) DePeal of Westfield, IN; many grandchildren and great-grandchildren; and many nieces and nephews. Visitation will begin at 10AM on Thursday, March 29th at Chapman Memorial Church of the Nazarene, 7520 East U Ave., where services will begin at 11AM. Rev. David Downs and Rev. Bruce Howell will officiate. Interment will be in Mt. Ever-Rest Memorial Park, South. Memorials may be directed to the charity of one's choice.